Hallohallo Inc. partnered with Samurai Gamers to hold a Philippine Arena of Valor online community tournament starting on July 19, 2018. The tournament features a 15,000 PHP prize pool, as well as the chance for the best teams and players to become part of Hallohallo Gaming's Arena of Valor professional team. 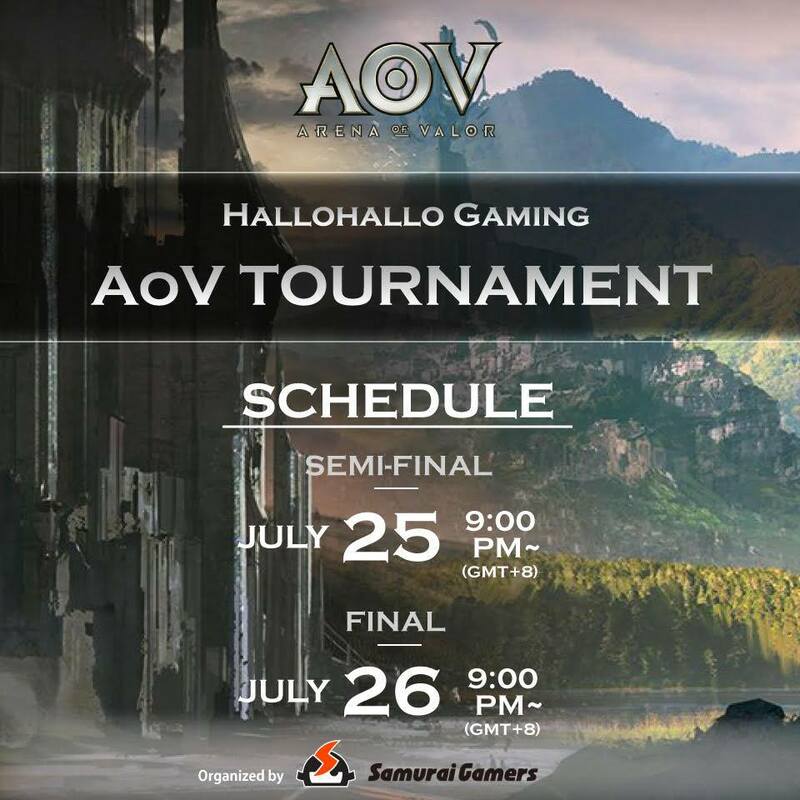 A total of sixteen teams from the Philippines will compete in a best-of-3 series to claim the highest share of the prize pool and the chance to represent Hallohallo Gaming in local and international Arena of Valor tournaments. Drag image to view tournament map. 2. 16 teams are chosen at random and are to battle in a number of Best-of-3 matches. All matches starting from qualifiers, quarterfinals, semi-finals, and finals will be settled in a Best-of-5 Match. 4. Players are not allowed to change their IGN during the duration of the tournament. Those who change their registered name in the middle of the tournament will be disqualified. 5. Team Captains are to coordinate with the Tournament Organizer / Marshalls to get the details of their match. 6. Once the tournament has begun, the teams' registered members are the only ones allowed to participate. 7. Teams scheduled to compete are expected to be available online TEN (10) minutes before their alloted schedule. If a team fails to be on time, they will forfeit match to their opponent. 8. Teams and players are given FIVE (5) minutes to get settled in the game lobby in their alloted time. If a team is incomplete after the five minute time limit, the team forfeits the match. 1. Teams will compete in a Best-of-3 series. The marshalls will decide which team will get the Blue and Red sides for the first match. Afterwards, the two teams will switch sides for Game 2; in the event of a Game 3, the participants will revert back to their Game 1 sides. 2. A mandatory 30-second in-game Pause will commence once the game has started - this is to give each member of the team a chance to load the game. After 30 seconds, the marshall will un-pause the game and will officially start the match. 3. Each team is given a THREE (3) MINUTE in-game pause per game which they can use to address any technical difficulty (i.e. lag, reconnections, etc.) Once a team exceeds their designated 3 minute pause, the marshall will un-pause the game, regardless if the issue has been resolved or not. 3a. In-game pauses should not be used during pivotal moments of the match (i.e. team fights, securing objectives, specifically Dark Slayer, Abyssal Dragon, turrets). Marshalls have the right to veto any team pauses that can disrupt the flow of the game. 4. After the conclusion of a match, each team will need to coordinate with the marshall who will create the in-game lobby for the next game. The marshall will then instruct the teams which side they will be assigned. 5. Teams can only substitute players in their team who has already registered as part of their team prior to the start of the tournament. 6. Teams will need to notify the marshall before the start of each game if they will substitute a player or not. 7. The marshall deserves the right to restart the match as he / she sees fit. 8. No trashtalking is allowed; those who will do so will be disqualified. 9. Players are not allowed to play other accounts during their designated matches (i.e. piloting is NOT ALLOWED). They can only play on the accounts that they registered with. The Arena of Valor Guide Page by Samurai Gamers is your best resource site for the game. We have a variety of hero guides, item and Arcana builds, news, updates, patch notes and more. Don't miss out on everything you need to climb the ladders and make it to Conqueror rank! Arena of Valor is a free-to-play mobile Multiplayer Online Battle Arena (MOBA) developed by Timi Studio Group and published by Tencent Games. Previously titled King of Glory, it features intense player-versus-player gameplay similar to the popular MOBA game League of Legends. The game adopts the familiar team-based format where players can choose to do battle in 1v1, 3v3 or 5v5 matches. Games take place on a three-lane map where teams must use the terrain to break through their opponent's defenses and win the match. The game currently boasts a roster of 40-58 unique characters (depending on the region), each with their own set of skills and attributes with varying play styles. Characters are divided into six classes: Assassin, Mage, Marksman, Support, Tank, and Warrior. Being familiar with each of the character's strengths and weaknesses is important in performing your role within the team and achieving victory. Matches in Arena of Valor last for only 15 minutes. This allows players to enjoy quick matches, whether playing casually or in ranked games. There is also a unique PvE adventure mode for players who just want to have fun with the game's non-competitive content. Due to its massive popularity, Tencent has partnered with Nintendo to bring Arena of Valor to the Nintendo Switch console. It was announced by Tencent on October 18, 2017 that registration for the game has opened in North America. Arena of Valor has an active player base of 160 million users worldwide. Since its launch on November 26, 2015, the game has become the highest-grossing free-download game app in the world. In 2016, the game topped the China pan entertainment festival "China IP index value list - game list top 10."